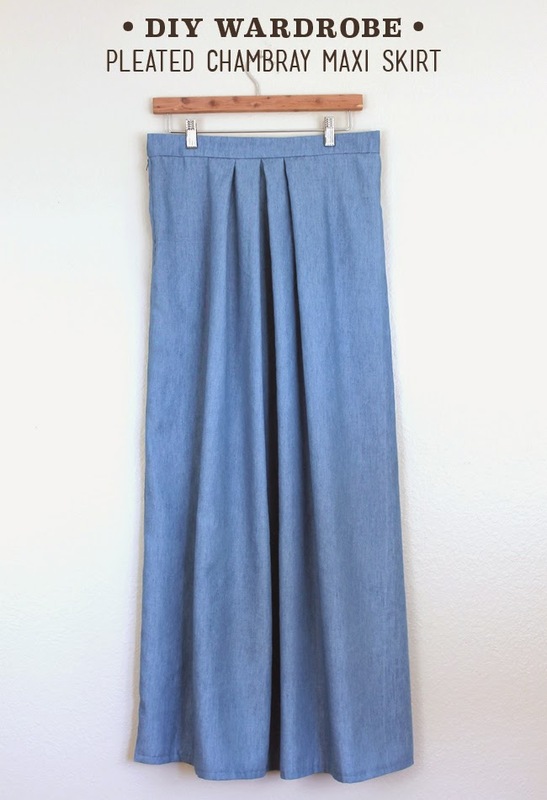 I've been wanting to make a maxi skirt for a few months now. I go to get dressed in the morning and imagine my outfit based around a maxi skirt and then realize that I don't have one! I wanted it to be a neutral, casual fabric that I could wear most any day. I had about a yard and half of chambray left over from these shorts that was perfect for this. The fabric is lightweight and has great drape. 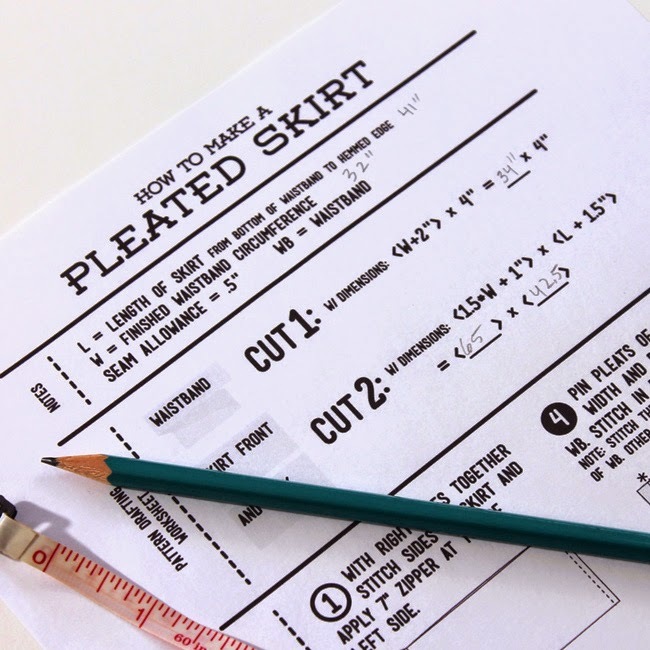 I used my standard pleated skirt formula to calculate the pieces I needed to cut. Get the printable template here. One change I made was that I just used one big piece of fabric for the skirt so that there is just one side seam where the zipper is placed. 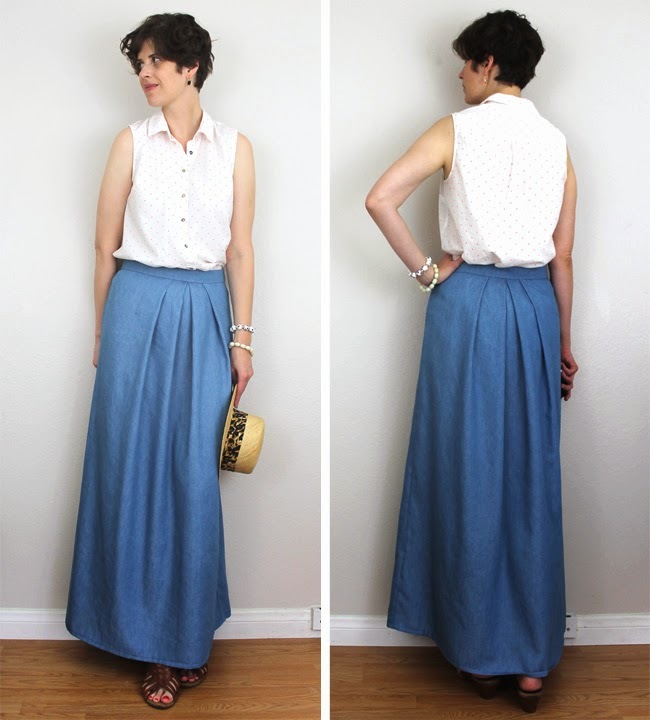 I made four pleats at the center front and the center back much like this inspiration outfit. The length and the chambray gives it a little bit of a prairie look, like I stepped out of Seven Brides for Seven Brothers but I love it anyway and expect to be getting a lot of wear out of it. Here, I went very country and styled the skirt with a refashioned plaid shirt, leather sandals (similar here and here) and straw hat (similar here). Most of the time, I'll probably forgo the plaid shirt and wear a simple tank top or tee. How would you style this this skirt? Beautiful skirt! Chambray is kind of magical because it can look refined and laid back at the same time. I love how you styled it in the first pictures. Your outfit almost has a turn of the (20th) century feel, even though the shirt sleeveless.